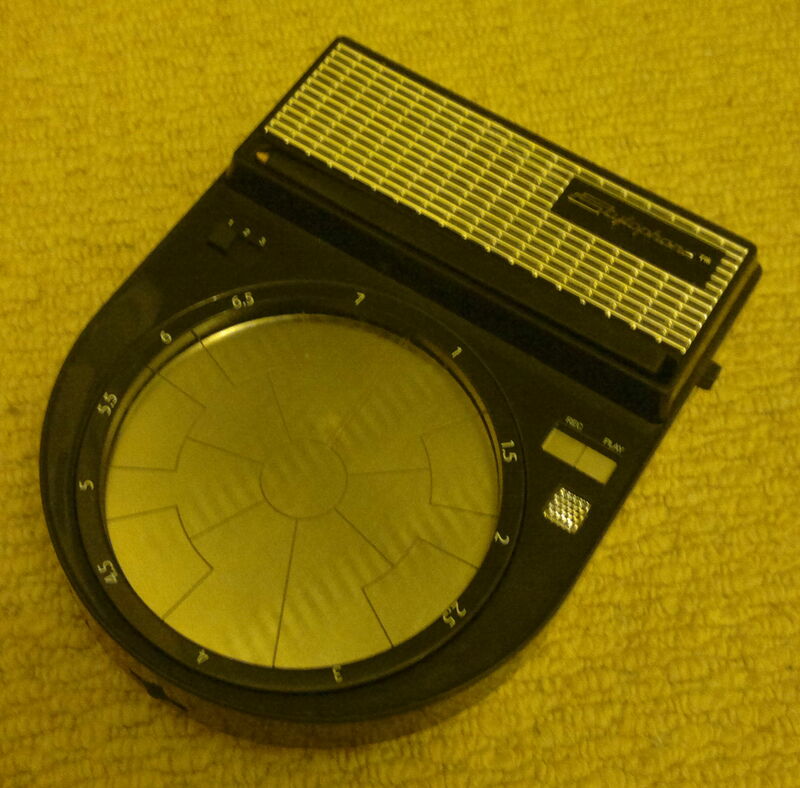 This morning, a visit to our local Royal Mail sorting office to pick up a package, saw the arrival of the last of the purchases linked to my Christmas Amazon vouchers: a Stylophone Beatbox. Given my musical tastes’ recent hard-left turn towards “retro electronica”—another of my Amazon voucher purchases was “Emperor Tomato Ketchup” by Stereolab—you could say the Beatbox is a timely arrival, and you would probably be correct 🙂 I was attracted by the idea of an electronic rhythm box/looper costing a tenth of a Korg Kaossilator, but with suitably vintage styling on the outside… and as a Stylophone fan of many years’ standing (well, on and off), well, how could I resist? It’s light. Very light. In fact, almost worryingly so (at least until you load in the three AA batteries it requires)—the unit feels a bit insubstantial when you first pick it up. This impression is reinforced (if that’s le mot juste here) when you eject the stylus from its holder. The stylus is still linked to the instrument by a single thin, flimsy plastic-covered wire, which is folded in half and squashed under the stylus when the latter is in its holder. One really would think that forty years’ advances in technology—not to mention ample empirical evidence from Stylophone users that the wire will simply break after a period of this treatment—would have resulted in an alternative stylus connection method being found. I like “retro” as much as the next muso, but seeing as the Beatbox isn’t a 1960s instrument, I wouldn’t have moaned at some improvement here. Small point, but it’s a nice touch that a short stereo mini-jack cable was included in the package. I plan to make a demo video with the Beatbox, and have in mind what I am going to do, so if all goes well, I would present the video along with the full review, which will come once I have had some time to get used to the instrument and hopefully use it on some actual recordings. Previous Post Beware of bargains?